Feel you are inconsistent with achieving your goals. Constantly face days that get away from you and never get done what matters most. Are somewhat scared of routines because they feel too stiff and rigid. Simply don’t know where to start with creating a routine. Don’t know what routines you need to implement to achieve your goals. When creating routines that will work for you, it is wise to start with larger, long-term goals and work your way backwards. You can do this by asking yourself, “What behaviors or actions do I need to take daily that if compounded over time will enable me to achieve my goal?” Approaching your goals as the tortoise does, using the ideology that slow and steady wins the race, usually does. The alternative is attempting to achieve your goals swiftly and with erratic, extreme action. One downside of that method is you will have inconsistent results and while focusing on one aspect of your business, you’ll have to neglect all other aspects. Instead, create routines that align with your goals, work them thoroughly until they work incredibly well for you, and progress toward your finish line at a manageable pace. Bookending your day with routines simply means starting and ending your day with the same series of habits day after day, week after week. I came up with the method because I wanted to provide a sort of framework for my time each day that would allow my good habits to work for me without the negative feeling of being trapped. As business owners, our days are often filled with randomness. There are days we have back-to-back meetings and days we can work quietly in our offices for hours without so much as a single interruption. 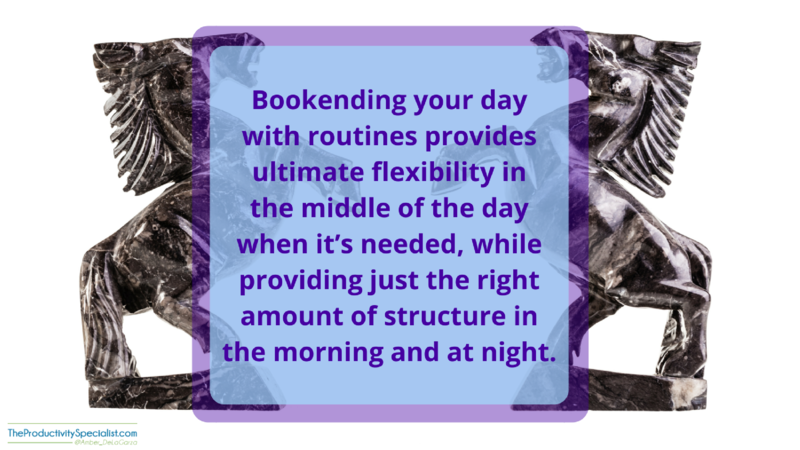 The bookending method provides ultimate flexibility in the middle of the day when it’s needed, while providing just the right amount of structure in the morning and at night. Bookending affords the opportunity to achieve larger, long-term goals by consistently encouraging purposeful, scheduled action toward those goals at the beginning and end of each day. Firstly, for each morning and evening routine you already have, identify the habits within it and write them down. The following day, post the list in front of you whether it’s on your phone, mirror, or monitor. Alternatively, you could utilize a habit tracker app instead of writing your habits down. I suggest Habit List for IOS and Habit Ball for Android. The apps help you track the individual habits in your routines that are layered on top of each other and provide feedback. Over time, they track your progress and success. Tracking your habits, whether manually or digitally, can be very valuable because it helps you determine which habitual actions you should ditch and which ones you should implement as intentional habits. Once you have established the current habits you desire to keep engaging in, determine what additional activities you want to add to your routine. They should be activities that align with your goals and help you make progress toward achieving them. Use the trigger method to help those activities become habits that you do consistently as part of a routine. Linda Fogg, the director of Tiny Habits®, uses the example of brushing her teeth to teach about habit creation during one of her courses. She always brushes her teeth before bed each night so she set that activity as a trigger for flossing which had not been a consistent habit of hers. Now every time she brushes her teeth, Linda consciously recognizes the activity as a trigger to then floss. By layering flossing on top of the habit of brushing her teeth, flossing eventually became a habit she didn’t even have to think about. Using the trigger method is an excellent way to create automated actions that grow into consistent habits. The proverb from Thomas H. Hall’s writings, “If at first you don’t succeed, try, try, and try again,” applies to routine creation. You may create an amazing routine that sounds great on paper but once you use it, you realize it’s stuck in a few areas. Don’t worry and certainly don’t give up. Perhaps you are attempting to create a habit first thing in the morning when you are far too tired to tackle the activity. Vice versa, you may be trying to engage in a habit such a meditating late in the evening when you’re always too riled up from your exciting day to close your eyes and inhale deeply. Everyone’s ultradian rhythyms are different and therefore the time and manners in which you can accomplish certain tasks the best is different from others. Rework the layers of your morning and evening routines over and over again until the flow feels good to you. When you are overwhelmed, as is all too often the case for business owners, it’s not the time to throw your routines out the window. Instead, it is the time to cling to your routines like a life raft saving you from thrashing ocean waves. When engineered to align with your personal style, schedule, and goals, routines can provide much needed stability. Bookend your day with routines in the morning and evening to additionally provide just the right ratio of structure to flexibility to keep you progressing toward your goals at a productive and comfortable pace.